No, I didn’t forget to put in the month and day of the release, I’m not sure what the actual release date is, but I do know it was released in 1990. If you happen to know this information feel free to hit me with it. As we bring in 2014, we’re also wrapping up 1990 on Time Is Illmatic. 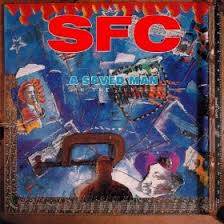 SFC’s previous record (Listen Up ) was filled with cheesy instrumentals, corny song titles, and poor execution, rendering it a complete hot mess. So, with the bar set so low things can only get better this time around. Whatever – Over a simply (and empty) instrumental Sup spits a one verse wonder, which left me anxiously waiting for its end. Not that Sup was a terrible emcee at this stage in his career, but he is miles away from the polished emcee he would blossom into a few years later. This was very forgettable. A Saved Man – Man, what’s up with these naked drum beats? Was it against SFC’s religious beliefs to sample a little James Brown or something? Then again, this was released on a small independent label so they probably didn’t have James Brown sampling money. I’ve never been one who thinks a hip-hop song should conform to any standard format (i.e. 3 sixteen bar verses, separated by the hook), but hearing Sup go on for what feels like 200 bars straight makes me want to reconsider. Team too much. Suplex 2 Mind – Okay, now this is more like it. The instrumental sounds like Sup chose to recreate rather than sample James Brown’s “The Payback”, and it still sounds pretty nice. Sup temporarily strays away from his strictly “Jesus” rhymes, mixing things up with a few battle spits. Nice. KACR 1 – When Christian hip-hop came on the scene back in the day it was frowned upon by most church folk, including Christian radio. On this short interlude SFC takes a jab at Christian radio for not getting behind Christian hip-hop. Awe, Christian beef, so cute. Idiot Box – This one is dedicated to the TV and its many poisons that subconsciously influence our minds. Sup makes a lot of good points on this one that even listeners who don’t believe in God can appreciate. The guitar licks sampled on the hook was a nice touch. Well done, gentlemen. Long Way – This is SFC’s interpretation of hip-hop meets praise and worship. The end result is not good. Sup invites female vocalist Appointed, who is apparently tone-deaf, since her adlibs at the end of the song sound like someone was killing a cat. Sup’s cheesy Casio keyboard instrumental doesn’t help matters either. This was God awful (no pun intended). Peculiar – The title of this song is built around the bible scripture taken from 1 Peter 2:9, in which Paul instructs the church to be a peculiar people, set a part and called out of the darkness (of course I’m paraphrasing). Sup does a great job of building on this without taking himself too serious or coming off self-righteous, a trap which many of his holy hip-hop contemporaries would fall into a few years later. Sup’s instrumental sounds like something Extra P would have produced back in the earlier nineties, which is definitely a compliment since I consider Large Pro one of the greatest (and underrated) hip-hop producers of all time. This is easily my favorite song on a A Saved Man (In The Jungle) . The Verdict – This is Sup’s dis record to…Satan? Over a simple drum beat Sup uses three verses to spit battle raps aimed at the Prince of Darkness (and I’m not talking about Big Daddy Kane). The verdict: this song was really corny. In Your Speaker – Sup invites a few of his bible study buddies (one who will read a lot more of later down the road) into the studio for this posse cut that you’ll completely forget existed as soon as the song is over. The Bomb – Sup’s instrumental sounds like a poor man’s Bomb Squad track and that is not intended as a compliment. Dude, this was a hot mess. My Alarm/ Freestyle – Over a reggae tinged instrumental Sup uses the first part of this song to tell a story about a traffic stop that morphs into quite the adventure. I won’t spoil the song for anyone, but Sup manages to keep the goofy storyline entertaining. The “Freestyle” portion of the song is just Sup giving shoutouts and chanting Christian hymns as the song fades out. Honesty – This short interlude will make you chuckle at how the song title and serious instrumental contrast with the juvenile subject matter, which I believe was SFC intent in the first place. KACR II – I don’t know how I feel about back to back interludes. This is another jab at Christian radio with DJ Dove respectfully, interrupting are regularly scheduled program to defend the legitimacy of christian hip-hop. 2 Much Chemistry – Decent. A Word From Our Pastor – It plays exactly how it reads. Jungle Message 2 Man – DJ Dove gets his solo joint, which uses some very cliché samples of what the jungle is supposed to sound like, over a drum beat with a few vocal samples about Jesus, black male statistics, more Jesus, and a Guns N Roses vocal sample. Guess which Guns N Roses vocal sample they used? Prime Time Mix – This is basically an instrumental version of “Idiot Box” with a few TV and commercial snippets mixed in for s&g. This was a very 1 Peter 2:9 way to end the album. In comparison to SFC’s first proper release Listen Up , A Saved Man (In The Jungle) is a vast improvement. Sup’s lyrical dexterity has improved since the last time we heard our sanctified friend, and while there are a load of crappy ones, Sup also manages to bang out a few moderately nice instrumentals as well. But don’t get it twisted: I didn’t say A Saved Man (In The Jungle) was a good album, but, an improvement over the last one. The majority of Sup’s instrumentals range from mediocre to terrible, and even though his verbals have improved he still has several relapses to his former robotic/sloppy delivery and monotonous subject matter. The album cover of A Saved Man (In The Jungle) (which is a collage that shows Sup with his head in a “grinder”, along with pictures of Malcolm, Martin, Huey, and nooses) would lead one to believe the content would be full of in-depth commentary covering religion, spirituality, race relations, and Sup confronting his own personal demons. Nope. You won’t find none of that here, proving the old adage true: never judge a book by its cover. A Saved Man (In The Jungle) may have worked better as a EP with a different title. Luckily for Sup and company this was just a stepping stone as their music would continue to improve on their next few projects.